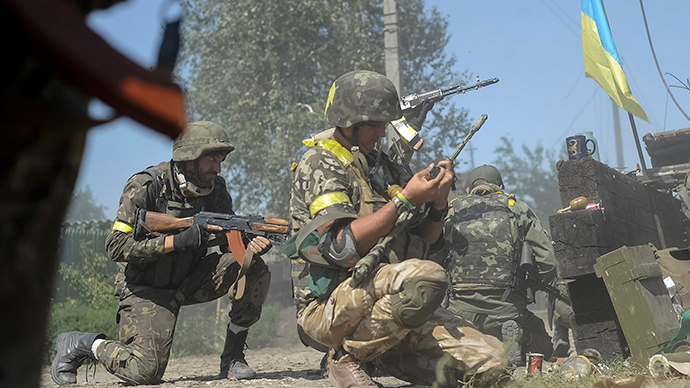 On Tuesday, August 20, a US army veteran named Mark Paslawsky was killed during a battle in Ilovyask, near Donetsk, which is currently held by anti-Kiev rebels. 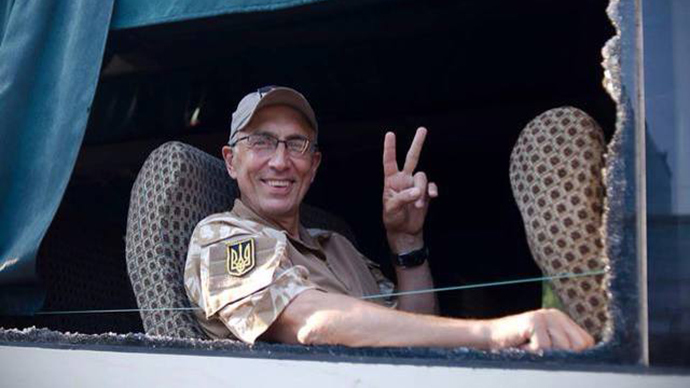 Fighting on the side of pro-government forces, the American had sprung to prominence because of his Twitter feed (@BruceSpringnote), often sharply critical of Ukrainian politicians, and a fawning video interview with Vice News’ Simon Ostrovsky shortly before his death. The 55-year-old West Point graduate, who was also a former investment banker, mainly focused on Moscow, Kharkov and Kiev, claimed he had changed his nationality to Ukrainian to enlist in the Donbass Battalion. Paslawsky fought under the pseudonym ‘Franko’ and served in the US army until at least 1991, when he was described as a captain in a New York Times op-ed. There was a very good reason for Paslawsky’s use of a nom-de-guerre like ‘Franko’ and the social media handle ‘Bruce Springnote’ and for the soft soap in the US media. Paslawsky was not an “ordinary Joe” from New Jersey with benign family connections to Ukraine who suddenly decided to help defend the motherland, he was the nephew of the notorious Nazi Mykola Lebed – who incredibly was employed by the CIA from 1949 to possibly as late as 1991. There is no insinuation that Paslawksy also harbored fascist or anti-Semitic beliefs, but family influences surely played a significant role in the formation of his world view. Lebed began his terrorist career in 1934 when he was sentenced to death for the murder of Polish Interior Minister Bronislaw Pieracki – later commuted to life imprisonment – but he escaped in 1939. He would go on to lead the genocidal ethnic cleansing of Poles in Eastern Galicia and Volhynia (the area around Lutsk and Rivne in modern-day Ukraine). Instead of facing trial for his vicious war crimes after his fellow fascists in Germany were defeated, Lebed was spirited to America where – based in New York – he gathered information on the Soviet Union for the CIA (a scheme known as Operation Aerodynamic). Of course, sheltering Nazis was a common US practice after the war, as bizarre as it seems today, with the primary reason being their potential usefulness in the fight against the Soviet Union. The best known example is Klaus Barbie who they helped to escape to Bolivia, and later Argentina, but according to a 2009 National Archives report “Hitler’s Shadow: Nazi War Criminals, US Intelligence and the Cold War” there were dozens of similar cases. Among them was Rudolf Mildner, who was “responsible for the execution of hundreds, if not thousands, of suspected Polish resisters” and was also involved in the deportation of 8,000 Danish Jews to Auschwitz. The Americans helped Mildner to settle in Argentina. Another was Hans Scholl, a member of Einsatzgruppe B in Belarus, which was blamed for the execution of more than 45,000 people, most of them Jewish. The report goes into great detail about the hideous crimes of Paslawsky’s uncle. One man extensively quoted is Moshe Maltz, a Jew living in Sokal, a town about 85 kilometers north of Lviv: “When the Bandera gangs (a name inspired by the chief Ukrainian Nazi leader, Stepan Bandera) seize a Jew, they consider it a prize catch. The ordinary Ukrainians feel the same way… they all want to participate in the heroic (sic) act of killing a Jew. They literally slash Jews to pieces with their machetes.” Lebed trained at a Gestapo center in Zakopane. Interestingly, in 1985 the US Government Accountability Office in Washington mentioned Lebed’s name in a public report on Nazis and collaborators who settled in the States with help from US intelligence agencies. The Office of Special Investigations (OSI) in the Department of Justice began investigating Lebed that year. The CIA shielded Lebed and, as late as 1991, it dissuaded the OSI from approaching the German, Polish, and Soviet governments for war-related records about Ukrainian fascists. Lebed, Bandera’s wartime chief in Ukraine, died in 1998. He is buried in New Jersey. Leded married Sophia Hunczak, the sister of Taras Hunczak, a professor emeritus of Rutgers University in New Jersey, where he lectures in Ukrainian, Russian and European History. He also teaches at the Taras Shevchecnko University in Kiev. Despite being a child during World War II, his Ukrainian language Wikipedia entry, judging by the links and tone, an official bio, lists his service as a courier for Bandera’s forces during the war. Hunczak has written articles for Ukrainian journals whitewashing Roman Shukhevych and his Nachtigall Battalion, including some heavy duty eulogies obviously intended for internal consumption in the Ukrainian language. The Simon Wiesenthal Center in Los Angeles claims that between June 30 and July 3, 1941, the Nachtgall and their German comrades kidnapped and killed 4,000 Jews in Lviv. In 2007, the pro-NATO Ukrainian government of Viktor Yushchenko issued a postage stamp commemorating Shukhevych. So how we do know Paslawsky is the nephew of Lebed after his extensive efforts to hide his true identity? His Ukrainian-language Wikipedia entry refers to him as being the nephew of Hunczak and also mentions a brother, Nestor. 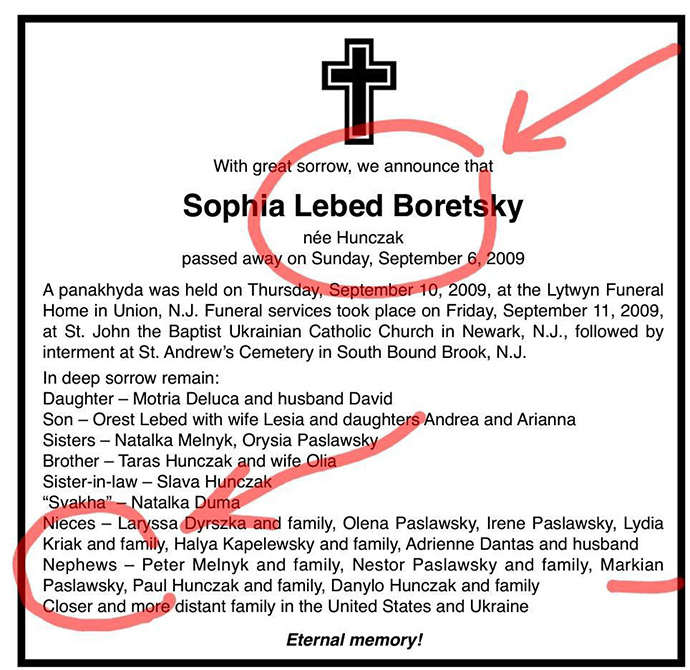 In the September 13, 2009, edition of the US newspaper The Ukrainian Weekly, there is a death notice forSophia Lebed(this page has been removed from the PDF copy on their website as of August 28, but copies are in circulation, one pictured above) lists all her living relatives, including her brother, Taras Hunczak, and her nephews Nestor and Markian (Mark in English) Paslawsky. 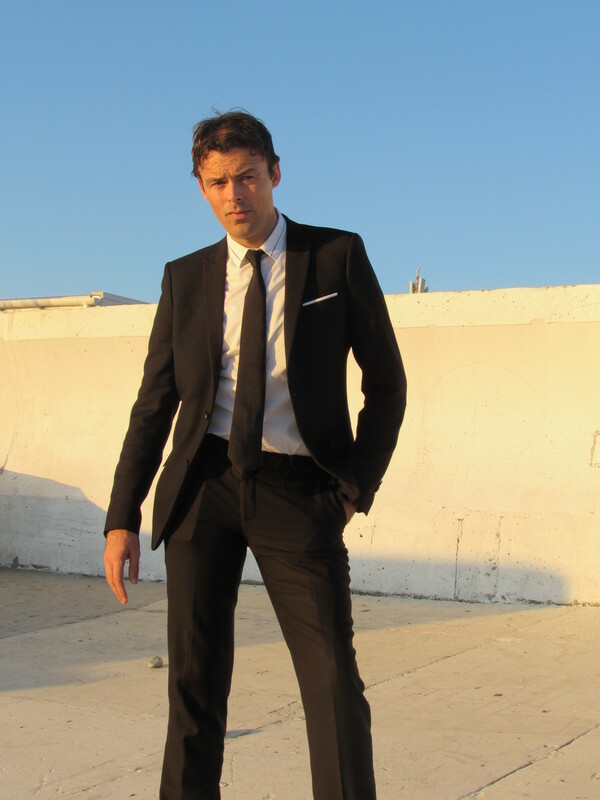 While it mentions Nestor’s family, it doesn’t for Mark – he told Ostrovsky in the Vice interview that he was a single man. A second death notice for Sophia, at the Union Funeral Home in New Jersey, describes her as the “beloved wife of the late Michael (the English form of Mykola) Lebed.” Interestingly, this page was removed on August 27 after Ukrainian violinist Valentina Lisitsa questioned the US government-funded Radio Free Europe/Radio Liberty about it on Twitter – it now exists as a cached version only. Somebody has been trying to hide the true story of Mark Paslawskyin recent days and western media have shown no interest in telling it. The German language has a word for coming to terms with the past: Vergangenheitsbewältigung. English has many but the US press refuses, once again, to use them.